How Much Has the Hong Kong Government Spent on Improving Air Quality? Demolition waste and glass are turned into bricks at Tiostone Environmental in Hong Kong. Each haul from the bars brings in between two and three tons of glass on average — not bad, given that the resources of Green Glass Green , the tiny nongovernmental organization managed by Ms. Lai, extend to just a few part-time drivers and volunteers. The destination for all this glass is Tiostone Environmental , whose small factory on the outskirts of Hong Kong makes paving stones from trash. By contrast, Belgium, the Netherlands and Switzerland recycle about 90 percent of their glass. The E.U. average was 67 percent in 2009, for a total of 11 million tons, or 25 billion glass bottles and jars collected that year, according tostatistics compiled by FEVE , a glass container industry association in Europe. In the United States, about one-third of all glass containers are recycled. Despite this, Hong Kong residents keep generating more garbage every year. The city’s seven million inhabitants produced 5.7 million tons of trash in 2004,according to government statistics . By 2010, the amount had swelled to 6.93 million tons. Less than 45percent of the HK$5.5 billion budget earmarked to combat air pollution over the past 10 years has been spent. That’s the claim of the Clean Air Network following its study of government spending on anti-pollution measures from 1999 to 2010. The group said there is a gross discrepancy between the allocated budget and the amount spent. It blames the Environmental Protection Department for its ineffective allocation of funds and enacting severely flawed policies. “Our analysis shows that there is an obvious under-utilization of resources and great inefficiency in the methods used by the government to tackle our growing air-pollution problem,” group campaign manager Erica Chan Fong- ying said. Chan said an example of a plan that lacks foresight is the 2007 subsidy scheme to encourage early replacement of pre-Euro and Euro I commercial diesel vehicles. Of all existing schemes, this had the least funds used, with only 19percent of the HK$2.5 billion available being taken up. During that time, only 16,000 out of 59,000 eligible commercial vehicles applied for the one-off subsidy. The group said the low popularity was down to the subsidy being too small to be an effective incentive. I refer to Guy Shirra’s letter (“Treat bad air problems as a crisis”, January 25). Last year in a letter to these columns, I said Hong Kong does not have an air pollution problem, it has an air pollution emergency. Thus, the government’s crisis managers should be treating the situation as an emergency. In Lai See (“Hong Kong’s Air Pollution Index is shamefully misleading”, January 27), Howard Winn quotes Professor Anthony Hedley as writing: “Hong Kong’s pollution is a significant cause of premature death from cardiopulmonary disorders. 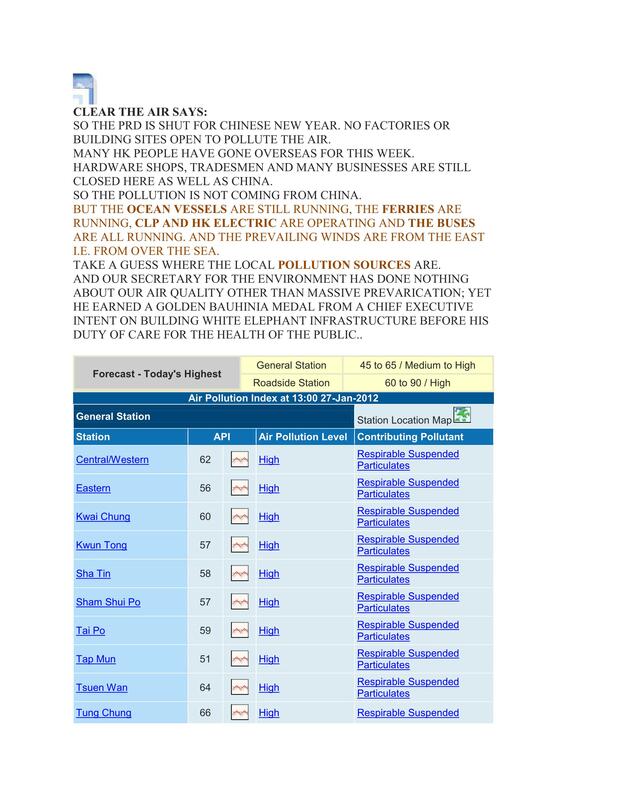 Lai See also mentions that around 3,200 deaths a year in Hong Kong can be directly attributed to the air quality emergency whilst World Health Organisation figures for bird flu are 341 deaths worldwide since 2003 and a worldwide total of 913 deaths from severe acute respiratory syndrome. We have a typhoon warning system that is presumably based on some form of risk management principles. The conclusion of this process seems to be that when the typhoon signal No 3 is hoisted, the weather has become sufficiently dangerous for workers to prepare to return home.When the No 8 signal goes up, workers remain at home. Given that very few people are killed or injured by typhoons in comparison to the numbers killed and injured by our poisonous air, the Air Pollution Index must follow a similar warning system to that used for typhoons. Workers should remain at home when roadside air pollution is deemed to be unsafe. Perhaps days and days of empty offices and lost production might ram home the point that there is an emergency and emergency measures are needed to deal with it. The long-awaited update of Hong Kong’s air quality objectives was finally announced by Secretary for the Environment Edward Yau Tang-wah this month, but it was only a post-dated cheque, to take effect in 2014, and still a far cry from the air quality guidelines set by the World Health Organisation. Yau also warned that this will mean increases in bus fares and electricity bills of between 15 and 20 per cent. But is that so? The current objectives were set in 1987, almost a quarter of a century ago. After the WHO updated its guidelines in 2006, the government commissioned a study and carried out a public consultation. All were in favour of early implementation of updated objectives, plus a regular review. This process was completed in 2009. But no announcement was forthcoming. When pressed, Yau said the government was taking steps to implement 19 measures that would improve air quality. This is subterfuge. Can you imagine a doctor telling a patient with hypertension to try taking 19 measures – such as quit smoking and drinking – to reduce his blood pressure but not tell him that the systolic pressure for healthy individuals should not go above 120? Improving air quality is one thing, being honest about the healthy standard is another. While Yau was quick to warn of an increased costs for cleaner air, he did not talk about the costs of pollution. 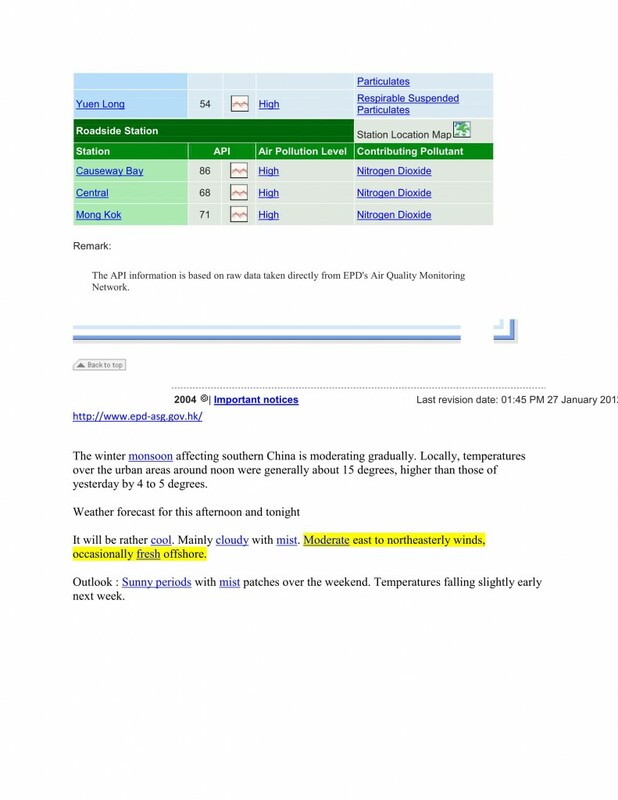 The University of Hong Kong’s School of Public Health publishes a real-time index that clocks the medical costs and sick days that are attributed to the effects of pollution. Every year, 3,200 people die prematurely due to pollution. The poor environment also dampens incentive for overseas investment. These costs are ignored by the government and not accounted for. The main culprit is roadside pollution, especially emissions from the thousands of old buses plying our streets that do not meet current European emissions standards. According to the government’s agreement with the bus companies, each bus can run for 18 years and we have to wait until 2020 before all of them exhaust their agreed life span. As pedestrians, we cover our noses when crossing the street, and we cannot afford to wait any longer. Investments in cleaner air benefit everyone, and there is no reason bus passengers should shoulder the costs alone. Our government can easily afford to reimburse the bus companies for their losses if they retire these old buses early and replace them with cleaner ones. Power companies have also raised their charges. But, in this case, we know that the culprit is the schemes of control signed with the government that guarantees the power companies a 9.99per cent profit based on fixed assets. Environmental concern was not the main reason for the unreasonable tariff increases proposed. Yau claims the new air quality objectives can’t take effect until 2014 because it takes time to go through the legislative process.In fact, under section 7 of the Air Pollution Control Ordinance, the secretary just has to gazette the new objectives without going through a legislative process. At the moment, the new Legislative Council complex has an indoor air quality problem and this is measured daily and compared to the standard set by a Finnish organisation. Likewise, we should not need legislation to set the standard for healthy air in Hong Kong. It is the duty of the secretary under the ordinance first to set the standard by gazette, and then to implement measures to meet that standard gradually. But this government does the reverse. Instead of announcing the right standards for all sectors to meet, it waits until all sectors are willing to meet those standards. It will wait for the bus companies to be able to afford cleaner buses, and for the Airport Authority to “endeavour” to meet the new benchmarks in its environment impact assessment for the third runway, and for the power companies to have more natural gas supply from the mainland, before informing us how poor our air quality actually is. How come we have a bigger port than LA but we do not get such reports from our EPD and Marine Department? Are they lazy or inept or want to conceal the data in Hong Kong? – or all three ? Comments can also be sent via e-mail to: ceqacomments@portla.org. Comments sent via email should include the project title in the e-mail’s subject line and a valid mailing address within the email. For additional information, please contact the Port of Los Angeles Environmental Management Division at (310) 732-3675. For additional information, please contact the Port of Los Angeles Environmental Management Division at(310) 732-3675. Preparations for a waste incinerator in King’s Lynn could be halted after a council voted to challenge the way it is being financed. Councillors at the Borough Council of King’s Lynn and West Norfolk voted on Thursday to seek a judicial review of government funding worth £91m. Proposed legal action by residents to stop the plant being built failed at the High Court in December. Norfolk County Council approved its construction in March 2011. King’s Lynn and West Norfolk council leader Nicholas Daubney said: “I believe we’re perfectly justified in challenging this decision. The council said it believed the financial arrangements in place between Norfolk County Council and the preferred contractors had impeded debate during the planning process. It said it would repeat a request to communities secretary Eric Pickles to “call-in” the matter for determination. A bid by campaigners in December for a judicial review into the way Norfolk County Council awarded the incinerator contract to Cory Wheelabrator failed. Last week Environment Secretary Caroline Spelman awarded £91m of private finance (PFI) credits towards the energy-from-waste plant at Saddlebow. The Borough Council of King’s Lynn and West Norfolk, Norwich City Council, some local MPs and campaign groups have openly condemned the building of the incinerator. Developer Cory Wheelabrator has been requested to clarify concerns over noise, dust, smell, air pollution and public health. A county council spokeswoman said the proposal to seek a judicial review had not halted the project and a consultation process was due to finish on 20 February. However, according to the Hedley Environmental Index, which follows World Health Organisation guidelines, the air quality can be classified as “very dangerous”. The government was caught napping with regard to Hong Kong’s air quality and then caught fudging the issue. That’s not a pretty picture; our air quality remains a serious daily threat to public health. It’s not that officials don’t want to improve air quality – of course they do – but they still can’t figure out how they can build highways, bridges, runways and incinerators without causing more air pollution. Their priority is to build infrastructure; they believe this is what matters more – you can always clean up later. They don’t see that they can do both. Earlier this month, Beijing released tighter air quality objectives for the mainland. Hong Kong officials didn’t seem to know this was going to happen. It put pressure on them to come to a decision on Hong Kong’s own objectives after two years of dithering. They had already been caught out once before: last May, the Ombudsman accepted a complaint from Friends of the Earth that the government was taking far too long to make a decision on revising Hong Kong’s objectives. Now, officials are hedging. The government has announced it will begin work on an amendment to the Air Pollution Control Ordinance, to be tabled for discussion in the next legislative year – when the current government will, in fact, have stepped down. The delay was said to be necessary because of the time it takes “for completing the legislative process and other necessary preparatory work”. The law doesn’t actually require a legislative amendment. The environment minister can amend the air quality objectives after consultation with the Advisory Council on the Environment. Since the council meets monthly, he could get this done well before the current administration steps down. But the government is not going to do that. It wants to make sure there’s a “transitional period” of 36 months before the new air quality objectives take effect. This should give officials enough time to get approval for certain projects, such as a third runway, before the more stringent standards apply. It would be seen as a disaster for the government if a third runway were not built, whereas putting off the implementation of revised air quality objectives is just a delay. To Hong Kong’s officials, this is being practical. The fact that the new objectives are necessary when considering projects is not acknowledged. The third runway and other new projects will indeed lead to additional air pollution. Thus, the early implementation of the new objectives is impractical from the government’s perspective. This logic is, of course, diametrically opposite to the aim of having air quality objectives in the first place. Our officials’ objective has shifted from health protection to infrastructure protection. It is this attitude that got them into trouble in the first place. They have left the cleaning up so late that catching up will require many urgent measures, such as banning old polluting vehicles, pedestrianising urban areas, regulating ships’ emissions, switching energy sources, and more. If the next administration retains the same mindset, it too will keep on fudging rather than pushing for aggressive pollution reduction.